Crib bumper pads have been around for a long time. Once they were thought of as a necessary safety tool for new parents. They believed that the bumper pads would help prevent their infant from hitting his head against the crib rails. Today, health experts and Sudden Infant Death Syndrome awareness groups recommend that parents do not use bumper pads at all. Standard bumper pads can cause a greater risk for your child’s safety. They can lead to suffocation, strangulation and even death. Still parents often encounter problems regarding crib safety. Older cribs have slats that may be too far apart and babies can get their limbs stuck in between them. When we transferred our youngest from the bassinet to his crib he ended up in that situation. He managed to wiggle himself around until he had one leg sticking out of the crib and his arm and side were stuck in between the mattress and the crib. During one particular nap time he did this four times! Of course this scared me half to death and I knew I had to do something. I knew that there had to be a product that could protect him from the crib rails without the risk of strangulation or suffocation. I had my “ah ha” moment when I found Breathable Baby products. Breathable Baby crib bumpers reduces the risk of suffocation, keeps your baby‘s arms and legs inside the crib, has collapsible fabric to prevent climbing, promotes airflow and breathability, has no dangerous ties or strings, adjustable fasteners, will move with a drop rail, and can be tucked below the mattress for extra protection. The mesh material is soft and light. It also fits all standard sized cribs. The first night that I had CJ in his crib with the Breathable Baby crib bumper pads he slept all the way through the night. I also slept easier knowing that he was safe. This year Healthy Moms is going to have even more fun giveaways by announcing “Our Favorite Things Giveaways.” I will write an article about a product that I purchased myself for either myself or my kids that I absolutely loved. Then as a special thank you to my loyal readers I will give away that same product and again purchase the prize myself. You can win your own Breathable Baby crib bumper pads by leaving us a comment. <img style="width: 301px; height: 301px;" src="https://i296.photobucket.com/albums/mm172/healthymoms/myfavoritethings.jpg" alt="
For every entry including extra entries please leave a separate comment. Winners will be chosen randomly from the comments and e mails that I receive. The contest ends on April 1 at midnight PST. I find it so interesting how information changes as time moves. My oldest had crib bumpers but my youngest did not. These look like a great middle ground. I would love to win these for my sister-in-law who is expecting. Been looking for this for my daughter who is due soon. This is really a great idea! Thanks for the chance! This really is an amazing idea! Thanks for the chance. These would be great for my great niece and her baby. I have been looking for this exact type of product. Thank you so much for the article. My 10 month old likes to use his bumper to try and climb out but this product will help keep his limbs inside and not work as a step stool. Thank you!!! I've actually been looking at this product for several weeks now. It sounds great and seems like a great alternative to the thick, padded bumpers that are not recommended. I've never heard of this before, but what a great idea (and comforting too!). Great giveaway! We're trying for our first baby, so things like this are godo to know. wow! this look great!! much better than the old bumper pads! this would be great for our baby due in June. Ive been looking for something like this, after finding out with dangers of bumpers. I subscribe to Healthy Moms!!! i am a fan of healthy moms on facebook. I keep going back and forth between bumper and no bumper. (I'm due in May.) This sounds like a great option since the crib we've chosen does have slats and I hadn't even thought about limbs getting trapped yet. These looks like a great product. My niece is expecting and this would be great for her baby. I'm so glad I found your post. I'm going to be a first-time grandmother and I didn't know that crib bumper pads were considered unsafe. 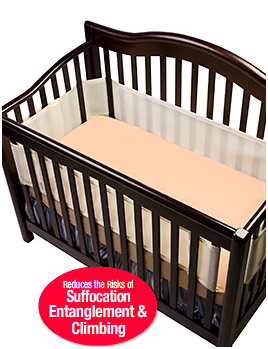 I'm glad someone has come up with a product that will keep baby safe in the crib…thanks for the chance to win one! I'd love this for our baby on the way! Perfect for my daughter's crib! I would love this! I am 10 dpo right now and feeling very pregnant…FX!! Subscribed to Healthy Moms via Feedburner. I'm a fan of Healthy Moms on Facebook (Alison Ad…).